Hope's Cafe: Yorkie Grooming Products-Giveaway and Review! If you have a Yorkshire Terrier, then you need some Yorkie grooming products! 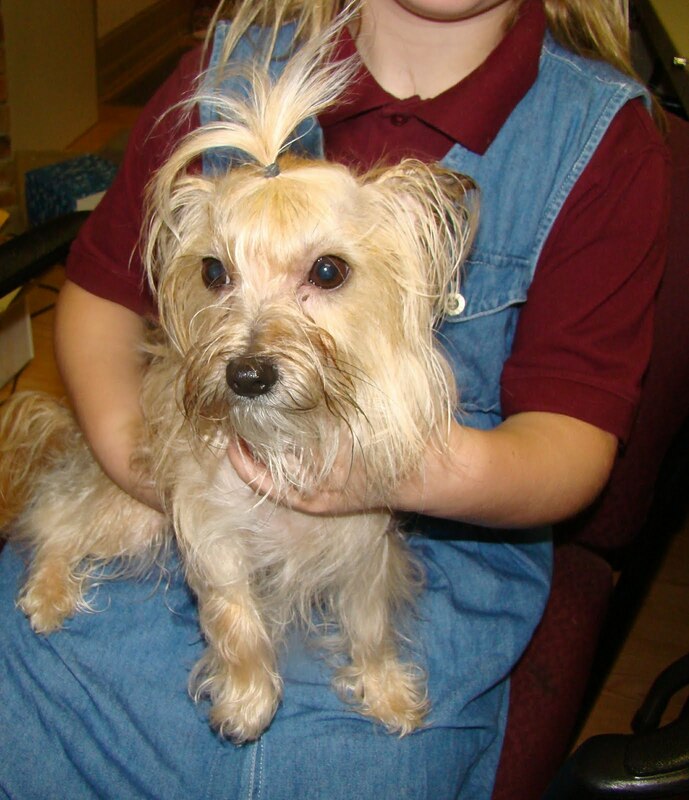 "Yorkie Splash was created out of a need for a shampoo to fit the specific needs of Yorkshire terriers. After trying numerous products, we here are Walnut Hill decided that there just wasn't anything on the market that worked well for every type of Yorkie - sensitive skin, coarse hair, cottony coats, silky coats, dry coats, or oily coats. We finally decided that keeping 5 different kinds of products around was just not manageable. So, we decided to make our own! After a lot of research and some trial and error, we came up with a "formula" that did exactly what we wanted it to - make every type of Yorkie coat look and feel amazing, and smell great, too. After using our shampoo on our own Yorkies, friends began asking how they could get their hands on some of our shampoo. So, we bottled a little. Pretty soon, word of mouth created a buzz that has continued to grow. We have been selling our shampoo to the general public online since April of 2009." Yorkie Splash & Shine generously sent me The Ultimate Set, which includes Yorkie Splash Shampoo, Yorkie Shine Conditioner, and Yorkie Detangling Spray. I honestly wasn't sure just how different/how much better Yorkie grooming products would be, compared to just normal shampoo purchased from a pet store. After using them, though, I'm sold! I can really tell a difference in Roxie's (our Yorkie/Maltese cross) coat after using these 3 products. All 3 products have a really nice smell, that lingers in the dog's hair even after rinsing/drying. No more nasty smelling wet dog! The shampoo lathers up really well, and it only took a small amount to thoroughly wash Roxie. After rinsing the shampoo out, we moved on to the next step-conditioning. The conditioner really helped smooth out her hair (Yorkies don't have fur-they have hair). This conditioner has a pH of over 7, whereas most conditioners only have a pH of 4. And it really does make a difference! After drying Roxie off, we used the detangling spray while we combed out her hair. This lessened (by quite a bit) the amount of tangles and knots in her hair. It made it a lot easier to brush Roxie out, without getting the comb caught in her hair. Roxie sits pretty well during her grooming (except when the comb pulls too hard in a knot), and when I used the spray, the tangles came out very quickly. All done and sittin' pretty! Yorkie Splash & Shine is giving a gift code worth $20.00 off a purchase of $20.00 or more to one of my readers! Now your Yorkie can get all prettied up too! Go to Yorkie Splash & Shine and tell me what product(s) you'd get if you won! This giveaway ends Tuesday, July 13, 2010 at 11:59 p.m. Please leave a valid email address in each comment, as this is how the winner will be notified. Winner will have 48 hours to respond, or another winner will be chosen. Giveaway open to US residents only. Disclaimer: I was not monetarily compensated in any way for this review. I did receive product for the purpose of review. All thoughts and opinions are mine. All quotes taken from the Yorkie Splash & Shine website. I would use the gift cert towards The Personalized Gift Set! I would get my little Vinnie the Ultimate Personalized Gift Set! I would get 2 personalized towels! I'd love to get some of the detangling spray. I have a chinese crested and he has hair, too. I completely understand how tangle-y their hair can get. I entered the Design-A-Mosaic custom mosaic giveaway. I entered the SmartLab toys giveaway. I entered the Bubble & Bee Organic GC giveaway. I entered the Tazzini Stainless Steel Water Bottle giveaway. I think I would the personalized towels because they're so practical and cute! I'd have to get the Personalized Towel for my yorkie, Lacey. i would put it towards the yorkie splash shampoo. my boss has 2 of the cutest yorkies ever and she would LOVE this stuff! I'd love to get The Gift Set! I'd get the Yorkie Splash and Shine Combo (Yorkie Shampoo and Yorkie Conditioner) for my baby.